I am a Pediatric Emergency Medicine doctor. I am also the mother of two children. I work in a hospital that has a pediatric emergency department that treats only children and is distinct from a general ED that sees all ages. My job is to take care of any and every ill kid that comes through the door. I’ve taken care of my share of brain damaged children who were deprived of oxygen at birth (from a variety of causes). I also attended hundreds of births, including a few in the Emergency Department. When something is going wrong or anticipated to go wrong during a birth, the OB or midwife calls the Pediatrician (common examples are meconium stained fluid or fetal distress) to care for the baby on its arrival. The problem with birth is that, when things go wrong, they can go wrong VERY VERY fast. Everything can be rosy one minute and then all hell can break loose even with a very low risk birth and a completely healthy mother. Unlike many doctors, I don’t believe that all homebirths are necessarily a bad idea. I believe that adults should be able to make their own decisions regarding their medical care, even if I disagree with them. HOWEVER, I believe that the parent(s) need to know and understand the risks of birth at home. And those risks include death, severe injury, death, catastrophic injury, and did I mention death? This is not a scare tactic. This is reality. 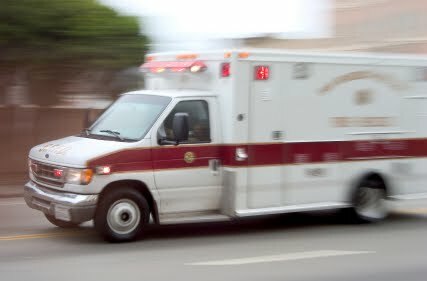 If you’ve called EMS, assume that it will take 10 minutes for them to get to your house, 5 minutes to “scoop and run”, and another 5 minutes to get to the ER (flashing lights and screaming siren the entire way). Your average Paramedic is fast and efficient. They will likely start an IV en route and in a healthy young adult with normal veins, it is easy to do. But some ambulances do not have paramedics and only EMTs. This is much more common in rural areas and volunteer squads. An EMT usually cannot (per protocol) start an IV or give medications (I volunteered as an EMT prior to becoming a physician), but they can provide oxygen via a face mask. So the ambulance option is approximately 20 minutes if you are “five minutes away”. 1. Large teaching hospital ED (common in a large metropolitan area): If you’ve called EMS, they may have called in to let us know what to expect and we have called a “Code White” (OB emergency) and the OBs are sprinting to the ED. But sometimes the radio connection is spotty and this message is not relayed. If you drive yourself or take a private vehicle, it is maybe 5 minutes to load the car, then 5 minutes to drive (so only 10 minutes), but we have no advance warning and the OB team will not be there waiting for your arrival. You arrive in the ER. If we are aware that you are coming, an entire team descends upon you in our resuscitation room, placing IVs, hooking up monitors, trying to get the story and your history. Someone will need to diagnose the problem. Likely someone uses the portable U/S machine to check your baby (unless he/she is crowned or head out, then we try to get the baby out and/or go to the OR). I’d estimate that this would take AT LEAST 10 minutes. If we have no warning (private vehicle), you will go to the triage area first (yes, even if you are bleeding and screaming in pain). Likely, you will be whisked back to the resuscitation bay, but it adds yet more time to the clock. Keep in mind that we do not know you or your history (past medical problems, allergies, medications, etc). The goal of the ED team is to save YOU. Your baby is secondary because if you die, the baby will likely die as well. Even the best team is going to take an additional 10 minutes after you arrive to have you prepped and in the OR for an emergency c/s (that’s with a rapid intubation and general anesthetic and an OR that is prepped and ready to go). So let’s say best case scenario from “decision” to “baby” is 45min and likely much longer. 2. Large teaching hospital OB ED: Some hospitals have a separate “Obstetrics ED”. In our ED, we stabilize the mother and transfer her to this part of the hospital. That is IF YOU ARE STABLE. A baby who is crowned or partially out is NOT stable and the mother stays in the ED. In the OB ED, similar things happen as above except that all the docs are OBs and (sometimes) Peds. Their OR is specific to the delivering mother. They see emergencies like this more often, so I’d estimate that they’d be able to do everything within 30min of your decision to transfer in an absolute best case scenario (staff waiting at the door, fully staffed and open OR, Peds team in place, etc). 3. Community hospital ED – the VAST majority of the hospitals in the US: only an ED doc is on duty (sometimes a Pedi ED doc if there is a separate Pedi ED, but VERY unlikely). The OB and the Pediatrician take emergency call from home and are usually required to live within 30 minutes of the hospital. Several of my Pediatrician friends work at community hospitals like this. After you arrive (15-30min) from your “decision”, the OB and Pedi are called. An ED doc does NOT do a c/s (unless mom is already dead, called a “peri-mortem c/s”). I probably could try, but that would ONLY be if you were dead and your baby was alive. Even then, I doubt I would be able to do it and keep my job. Assume that the ED doctor has been able to deliver your baby, keeping in mind that most of them have only delivered a few dozen in their lives, likely during training years or decades prior. Often there is only one ED doctor at a time working, so the focus is split between you and the baby. ED doctors can intubate (put a breathing tube in) anyone, but s/he may not have intubated a newborn since s/he was in school. And newborns are VERY different than adults and even children. I’ve put breathing tubes in babies weighing less than one pound, but I’m still at least 15 minutes away. Most ED doctors are trained in PALS (pediatric advanced life support), but NRP (neonatal resuscitation program) is usually not required. It is not even required of me, and I only see children (unlike a general ED doctor). Most ED nurses are EXCELLENT, but they haven’t done NRP either… So you have maybe one hour between decision and OB/Ped arrival. And that doesn’t include time to transfer to a high level NICU (not found at most community hospitals). So let’s say very very conservatively that it will take at least 30min from “decision” to “baby” (and more likely up to an hour or more). My question is: how long can your baby hold his or her breath? Is a 5 minute delay worth $8 million? The judge thinks so. OBGManagement. AN INFANT’S HEART RATE was 100 bpm at birth. She was blue and not breathing, and suffered seizures in the first 24 hours of life. She was found to have brain damage, CP, and spastic quadriplegia. She requires a feeding tube and is unable to speak or walk. PARENTS’ CLAIM The nurse should have called the NICU team before the baby’s birth because fetal distress was evident. The team arrived and began resuscitation 5 minutes after birth. The delay allowed for a lack of oxygen, which caused brain damage. DEFENDANTS’ DEFENSE A placental infection caused the baby’s distress. VERDICT A $8,583,000 Ohio verdict was returned against the hospital.